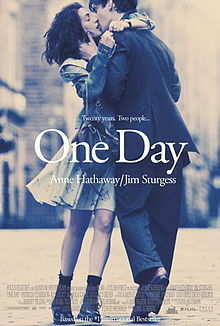 When I first read the premise behind One Day it kind of struck me as a long, drawn out “24” style rom-com. The “24” aspect really appealed to me, and I checked it out and it was sorely lacking in the com department. I’ve never read the bestselling novel from which it was adapted, but I think the book probably is a lot more entertaining and emotionally rewarding than the movie was. Basically, Emma (Anne Hathaway) and Dexter (Jim Sturgess) meet on July 15th, 1988 and then the movie shows us every July 15 from then until 2011. Kinda neat in theory, but the execution is so dry and boring and cliché-ridden that you’ll probably tune out before you even have a chance to become emotionally invested in the characters. It also doesn’t help that one of the characters is played by Jim Sturgess who is almost at a Ben Barnes level of bland but with more of an annoying tinge to him. You know how it’s going to end up, no matter what curve balls fate throws at these two characters, and for the life of me I did not understand why Emma was so interested in a man so unworthy of her. Dexter never deserved her and in fact, one of the later scenes in the movie pretty much echoes what the me – the audience of one – was thinking, and I thought it was all so average and kinda made me angry too. Long-time blogger, Canadian, cine-snark-aphile, Tweeter and generally lonely hearted guy.